We are one of today's stops on The White Forest Blog Tour. This tour is hosted by Shane of Itching For Books and we thank her for including us. We have an Author Spotlight, our review and a giveaway for a hardcover copy of the book (US only). In the bestselling tradition of The Night Circus and Sarah Waters’s The Little Stranger, Adam McOmber’s hauntingly original debut novel follows a young woman in Victorian England whose peculiar abilities help her infiltrate a mysterious secret society. Young Jane Silverlake lives with her father at a crumbling family estate onthe edge of Hampstead Heath. Jane has a secret—an unexplainable gift that allows her to see the souls of manmade objects—and this talent isolates her from the outside world. Her greatest joy is wandering the wild heath with her neighbors, Madeline and Nathan. But as the friends come of age, their idyll is shattered by the feelings both girls develop for Nathan, and by Nathan’s interest in a cult led by Ariston Day, a charismatic mystic popular with London's elite. Day encourages his followers to explore dream manipulation, with the goal of discovering a new virtual reality, a place he calls the Empyrean. A year later, Nathan has vanished, and the famed Inspector Vidocq arrives in London to untangle the events that led up to Nathan’s disappearance. As a sinister truth emerges, Jane realizes she must discover the origins of her talent and use it to find Nathan herself, before it’s too late. Itching For Books will host The White Forest Twitter Party on September 11, the book's release day! 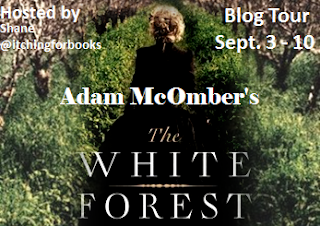 Adam McOmber’s novel, The White Forest, will be published by Touchstone, an imprint of Simon and Schuster, in September 2012. He is also the author of a book of short stories, This New & Poisonous Air (BOA Editions, 2011). His work has appeared in Conjunctions, StoryQuarterly, The Fairy Tale Review, Third Coast, Quarterly West, The Greensboro Review and Arts and Letters . 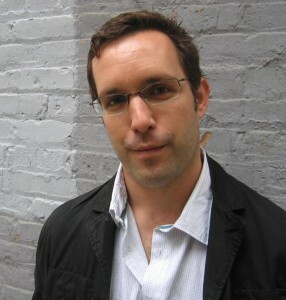 He has been nominated for two 2012 Pushcart Awards and received an AWP Intro Award. He lives in Chicago and teaches at Columbia College where he is also the associate editor of the literary magazine Hotel Amerika. 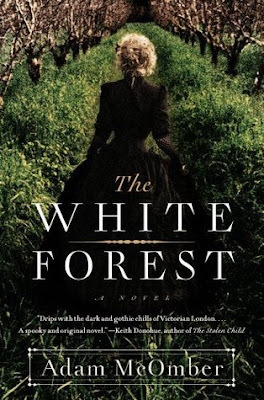 I will always carry inside me a fondness for Gothic classics like Jane Eyre and Adam McOmber's debut YA novel, The White Forest, has joined my select group of favorites. Time can only tell if his book will become a classic but it does contain the makings of one. From the first page, this is no typical YA fare, no apparent love triangle or brooding teens will be found on its pages. This story invokes the reader to ponder what is written and said and think of the "what-ifs" that exist outside of the norm. McOmber's prose is lovely, thought-provoking, and surprisingly realistic from a male writing a female point-of-view. I can only equate his writing like a gorgeous forest of dense foliage that one must make their way through, but one must stop to admire the beauty of the scenery along the way. The plain Jane Silverlake has lead a lonely life. Motherless at six, afterwards her father walked the halls of their Hampstead Heath estate like a ghost. One could call her a recluse if it weren't for her two friends, Madeline and Nathan. Both of her friends are gorgeous and they spend much of their youthful days walking the wild heath and conversing. As they get older, Nathan enlists and fight in the Cremea War and comes back changed. He begins to succumb to the allure and teachings of Ariston's Day cult, something both females regard as a negative association. Many of the wealthy socialites, primarily male, fall in with this group and Nathan begins to change. To the horror of his friends, Nathan becomes a skeleton of the vibrant young man they grew up with. He becomes fixated, especially harboring a passion for the Empyrean, another plane or reality. When he disappears, Jane blames herself. You see, Jane is not a 'normal' type of girl, she has the ability to see the 'souls' of man-made objects. It is this ability she shared with her two friends and the same ability Ethan became fixated with. After Nathan's disappearance, it is only Jane who can enter the Empyrean and save her friend, before it is too late. And this is where I end my review because I cannot reveal more of Jane's plight nor of her travels. One must join her through the perils of her adventures. While I found the beginning of the novel slow going, I must admit I felt the same way about my beloved Jane Eyre, and when the story took off, I went along with it. The inclusion of Nathan's diaries really helped flesh out his character's descent and watching the three friends develop, grow and change as the novel progressed was intriguing to watch. There were times I wanted to know more about Jane's 'ability' since its premise was fascinating and the mythology rich. Dark, dense and decidedly different, The White Forest is a strange, peerless literary experience. Adam McOmber has made Gothic storytelling popular again. Cover comment: I find this cover grabbed me, I wonder about the young woman walking through the field and about her destination. Book source: I received a hardcover copy of this book from the publisher in return for my honest review during a book blog tour.